Recently I attended the DMAW’s monthly luncheon where a packed house turned out to hear Roger Craver, Founder of DonorTrends and editor of The Agitator, share his insights on integrating year end campaigns. Multichannel communications are critical to successful fundraising. Direct mail donors who have an email address on file are 150% more valuable than direct mail donors without an email on file. Email addresses shorten the time to achieving a second gift … and more than double the retention rates of one-time first year givers. An SMS message following a solicitation can increase renewal rates by 25%. Donors with email addresses give 50% more gifts per donor, and have an average gift that is 67% higher. If you haven’t yet, it’s time to create a budget for acquiring your donors’ email addresses, mobile numbers and more. A little investment can have a huge impact on your retention rates. Your donor has changed – and it’s your job to understand what they need. Younger donors don’t behave like the generation that came before. Donors have changed from a “tell me” generation to a “show me” generation that expects organizations to show them the impact of their support with photos, stories, videos, conference calls and more. And donors expect you to listen to them and to hear their advice, concerns and opinions on your organization and your issues. Fortunately, new communication channels are perfectly suited to engaging donors in dialogue … and an organization’s ability to retain its donors will increasingly depend on its ability to do just that. To create strong, multichannel efforts, organizations have to change how they work. Follow the 75% rule. New channels won’t wait around while you craft the perfect tweet. Accept communications that are 75% perfect and 100% on time. Understand the ROI of each channel. Even when creating a multichannel campaign, be sure that you focus most of your time and energy on channels that have the greatest return on investment. New technology allows us to go back to old ways of fundraising. Classic fundraising techniques still work better than anything else. 50% of donors say they were motivated to give because “a friend asked,” and fundraising emails sent by a friend have open rates of 90% (compare that to your last campaign!). Use new channels to make your campaigns more personal, more timely, and more direct – all the elements that have always led to successful fundraising. Do you have other great stats on the value of multichannel campaigns – or tips on smart, year-end strategies? We’d love to hear them! 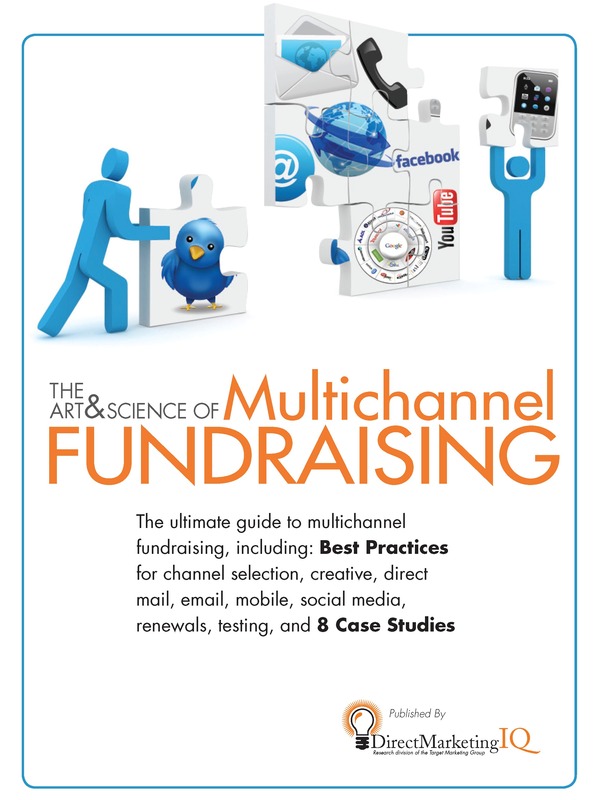 If you ever find yourself scratching your head about which tools to use for your fundraising efforts – or how to fit multiple channels together – you might want to pick up The Art & Science of Multichannel Fundraising this summer. Eliza and I wrote one of the chapters in this new book from Direct Marketing IQ, and it contains eight more from multichannel fundraising thinkers and doers like Roger Craver of The Agitator, Jo Sullivan, Joe Boland of Fundraising Success magazine, and others. It also contains a bunch of robust case studies that illustrate cutting-edge applications of best practices in multichannel fundraising. While the perspectives, case studies and channels discussed are refreshingly diverse, a few universal principles of multichannel fundraising come through loud and clear in the book. Most notably, whether it’s direct mail, email, telemarketing, mobile, social media, or all of the above, the new terrain of multichannel fundraising is guided by the same old-school basics of good marketing. Happy reading, and happy Friday!